DNS Manager is a multitenant software automation tool designed to deliver advanced DNS services to hosting providers and businesses. The multitenant platform comes with rich DNS management features built-in to simplify DNS administration and make it safer. It’s fast, user-friendly and easy to virtualize. The installation takes less than 10 minutes. DNS Manager’s multitenant, role-based design comes with two hierarchical management levels, administrator and client, allowing you to serve tens of thousands of customers with a single deployment. DNS Manager offers full support for IPv6 for service providers and businesses who are preparing for the transition to the latest Internet protocol version. With Round Robin load balancing, DNS Manager monitors non-responsive servers and, based on their availability, it can disable/enable their DNS records from the round robin poll. Administrators can easily export data for individual clients or even the entire database in .xml format. 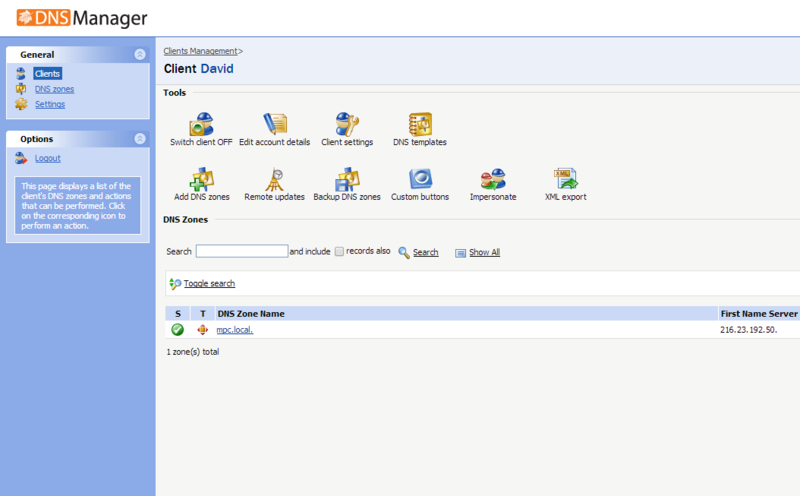 This feature can be used for compliance monitoring, backup and disaster recovery. Small providers can deploy DNS Manager with minimal costs on virtualized environments. It helps their business grow from day one, as it eliminates DNS downtimes and automates management operations. Larger hosters can get multiple DNS Manager servers to increase reliability and manage over 100,000 zones. DNS synchronization with hosting control panels is performed automatically. 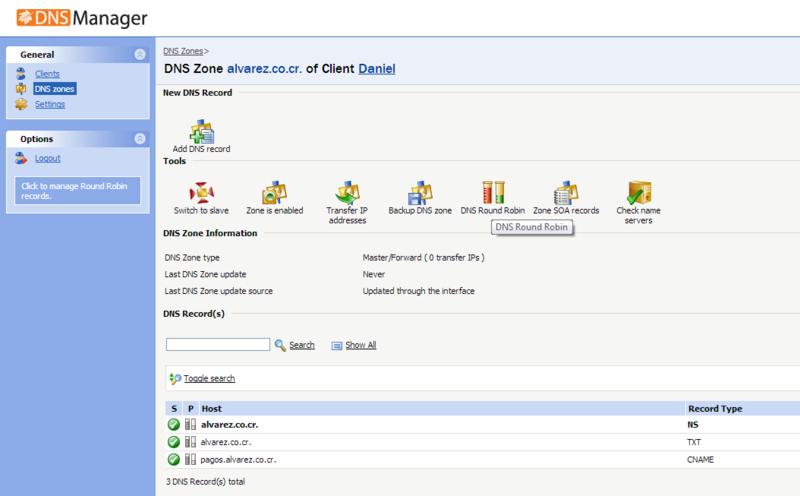 ISPs can allow their customers to access the DNS Manager web interface and manage their DNS zones. Customer satisfaction is increased and operational costs are reduced to a great extent. Also, IP telephony providers can manage their ENUM infrastructure in a fast and convenient way. Data centers can offer DNS hosting services to customers without increasing operational costs. DNS Manager architecture allows customers to disable the DNS server on their hosting machines, synchronize them with the Data Center DNS hosting infrastructure, and still let their end-users create, delete, and edit zones from any hosting control panel interface. All such changes are replicated in the powerfull Data Center DNS infrastructure in just a matter of minutes. Advanced services, like DNS load balancing, can be easily delivered. By using DNS Manager, businesses build up a solid, geographically distributed redundancy for their online presence, solve DNS management shortfalls, and speed up the delivery of complex Internet applications. Most service providers and organizations have to deal nowadays with DNS records used by modern applications, IPv6, DNS load balancing, redundancy, and management issues. DNS Manager helps your business scale. 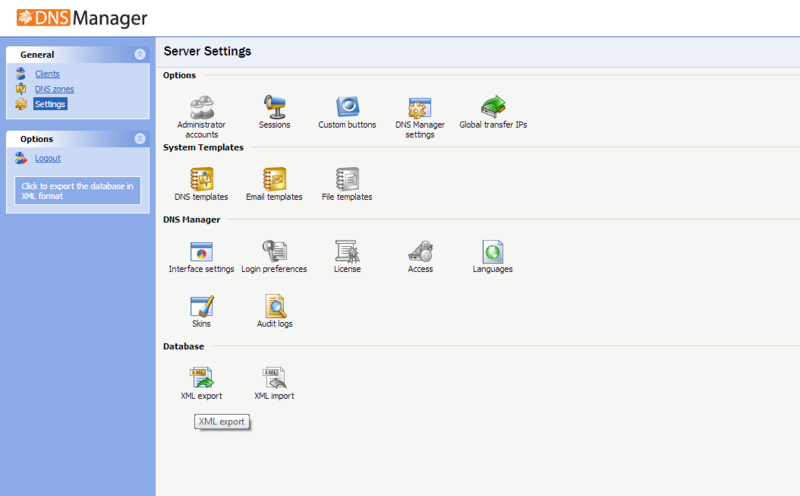 Configure and control all data on master and slave servers from a single, centralized web interface. DNS Manager's multitenant system allows you to view and edit DNS data through multiple isolated accounts. And that means multiple layers of security. You get high availability and redundancy. The system natively integrates with the most popular hosting panels. Edit all DNS data fast and easy in a friendly, yet powerful web interface. Save time and reduce the chance of errors. Simplify management of complex infrastructures with DNS automation features including DNS load balancing, data replication, and zone centralization. Our solution is automated and can be installed in virtualized environments with distributed architecture and a mature API.